Unsurprisingly, ministries centered on pragmatic means and measurements produce fruit of a sort: numbers. Attendance will always swell when we entertain, titillate, market, build, placate, and coddle. But is this Spirit-wrought fruit or the cheap plastic stuff used to decorate model homes? Paul recognized long ago that “successful” ministry might not stand under God’s scrutiny. Right after he reminds us that God alone can cause the growth (1 Corinthians 3:6-9), he paints a vivid picture of God’s future judgment of ministry leaders (3:10-15). Some leaders build carefully, and their “work”—the people they have served over the years, as verse 9 makes clear—survives into eternity; the Spirit has brought about genuine renewal. Conversely, other leaders build haphazardly, content with the structure and not the substance; when judgment comes, their building—again, the congregation they have served—perishes in the flames. The stakes seem pretty high. How precisely do pragmatic leaders bring about the destruction of the churches they serve? Not because they are malevolent, but because they are deceived. Specifically, they are deceived into thinking they can do it. It’s taken care of because it is in their hands. Look at how this works. 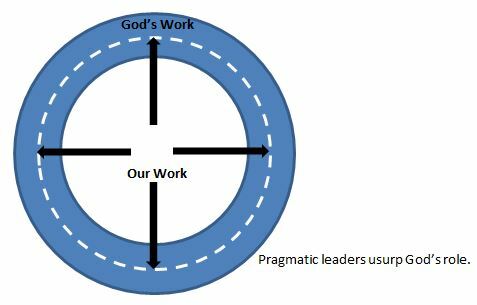 Pragmatic leadership assumes part of God’s role. That is, they place themselves in charge of (some of) the results as well as the responsibilities, the fruit as well as the faithful service. In so doing, of course, they cut themselves off from the Spirit’s power, leading to fake fruit: spurious conversions, consumers instead of disciples, etc. In addition, pragmatic leaders assume the role of the congregation too. Instead of equipping the saints for works of service (Ephesians 4:11-12), they skip the equipping and do the ministry themselves. Instead of training congregants to engage in personal evangelism, they tell them to bring their friends to the service to hear the gospel proclaimed, for example. 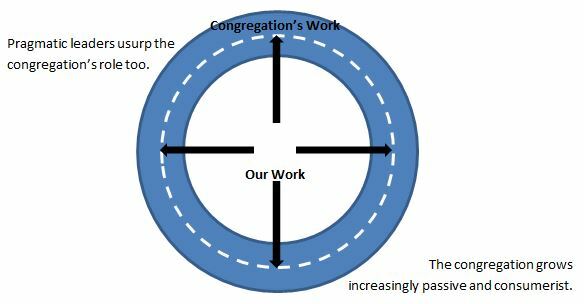 Ministry becomes centralized and human-centered. This leads inexorably to consumerism. Once the congregation has been trained not to minister, they become passive spectators at best, and more likely become thoroughgoing consumers. They will then evaluate churches and ministries along pragmatic and consumerist lines—e.g., “Do my kids like the youth group?” instead of “Does the youth group faithfully engage in relational disciple-making, which I know my children need?”—and the cycle perpetuates. 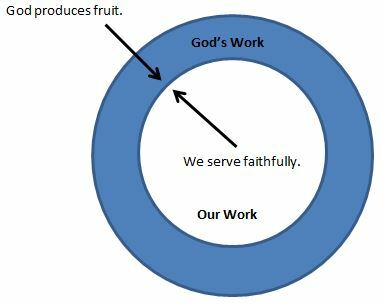 Pragmatic leadership produces fake fruit and consumerist spectators, instead of vital, flourishing, disciple-making followers of Christ. This destroys the church. Paul offers slight comfort to those building thus: “If it is burned up, the builder will suffer loss but yet will be saved—even though only as one escaping through the flames” (1 Corinthians 3:15). But escaping through the flames will provide little solace to those who genuinely love the congregations they serve, for they perish in this scenario. May it never be so!